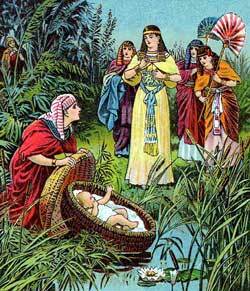 The baby Moses in found hidden in the bulrushes, and brought to Pharoah's daughter. OSEPH DIED IN Egypt when he was a hundred and ten years old; and all the people mourned for him. Some time after this, when the descendants of Jacob had become very numerous, there was a king of Egypt who treated them in a harsh manner. He tried to make slaves of them, setting them to all kinds of hard labor. But, the more he oppressed them, the more they increased in number; and the Egyptians were afraid lest, in time of war, the Israelites might turn against them, and make their escape out of the land. So the king commanded that all the sons of the children of Israel, or Hebrews as they are also called, should be put to death as soon as they were born. But the Hebrews to whom he gave this wicked command did not obey him; at which the king was so angry that he ordered his own people to throw all these poor little children into the river. At this time a Hebrew named Amram had a son born: he was a beautiful child, and for three months his mother, Jochebed, succeeded in saving him from the Egyptians. But at last she found she could no longer conceal him. So she made an ark, that is, a sort of cradle, of bulrushes coated over with pitch, laid him in it, and then placed the ark among the reeds that grew by the riverside, while his sister stood watching in the distance to see what would become of him. Presently the king's daughter, attended by her women, came down to the river, and, perceiving the ark among the reeds, she sent one of her servants to bring it to her. It was accordingly brought; and when she saw the poor little child crying, she was sorry for it, for she knew it must be one of the Hebrew children whom the king had commanded to be killed, and whose mother had laid it there, hoping that some one would have compassion on it. The child's sister, seeing how the princess pitied him, then came forward, and asked whether she should fetch a Hebrew woman to nurse it for her. The princess bade her do so. So she fetched his own mother, and the king's daughter told her to take the child away and nurse it for her. Then his mother joyfully carried her little one home again. When he was old enough to be taken to Pharaoh's daughter, she called him her son, named him Moses, which means "drawn out of the water," and had him taught all that was known to the Egyptians, who were a very learned people.